Awhile back, I saw this pin on pinterest. I loved how the floral collar stood out against the dress' ivory linen and the way the details of the sleeves really shined. It immediately brought to mind the Oliver + S Puppet Show dress. Since ivory would stay clean for about 2 seconds around here, I decided to go with a grey linen. This is a medium weight linen and I really love the body it gave this little dress. I made a few modifications to the pattern. First, I made the body of the dress into one piece instead of two (bodice + skirt), which also meant removing the darts. I wanted to keep the lines simple, so the focus would be on the collar and the sleeve detail. I also removed the button placket and used a zipper closure instead, for those same reasons. I decided to fully line the dress. I attached the lining to the zipper seam allowance and the dress seam allowance for a clean finish. I learned this technique on the Hanimi pattern. I love it. 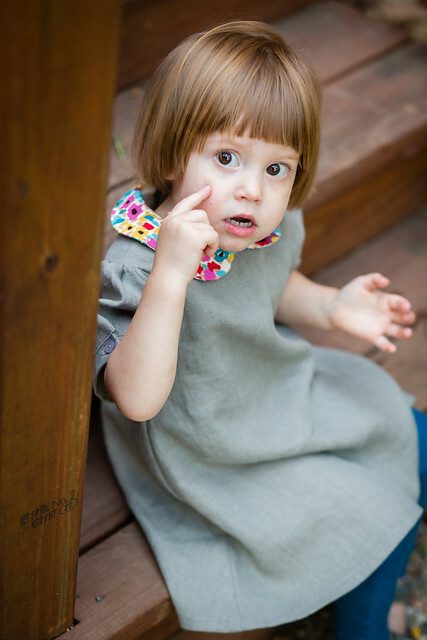 With all of those modifications, I forgot that I normally cut Oliver + S patterns down a size in width for my girls. It's just intuitive when sewing for Indigo and Tarikua, but it's been awhile since I've sewn an Oliver + S pattern for Iris and I forgot. So, the dress turned out to be too wide. 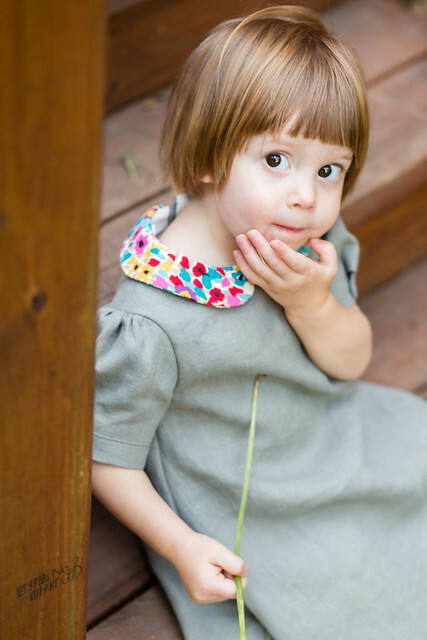 After I tried it on Iris and saw she'd need to grow into it, I actually hadn't planned to photograph her in the dress. 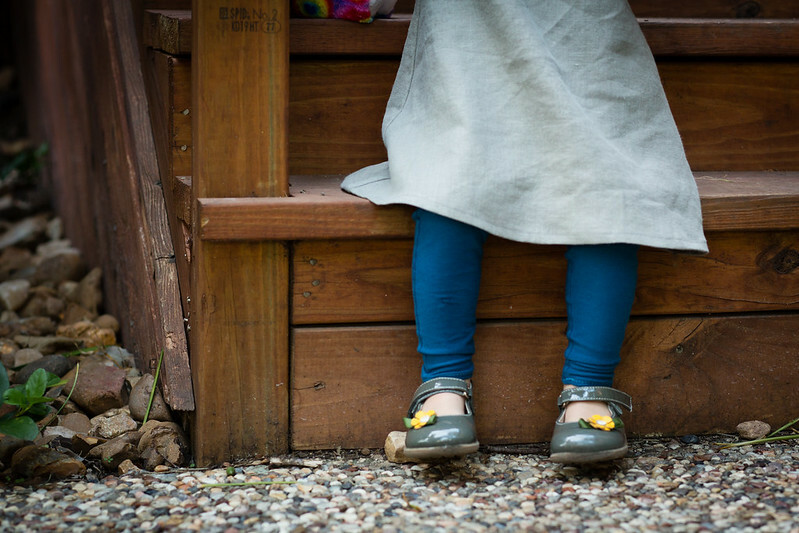 But as I was taking pictures of the dress on the fence, Iris followed me out, wearing only her new leggings. I decided to put the dress back on and take a few photos of her in it. How could I resist this face? 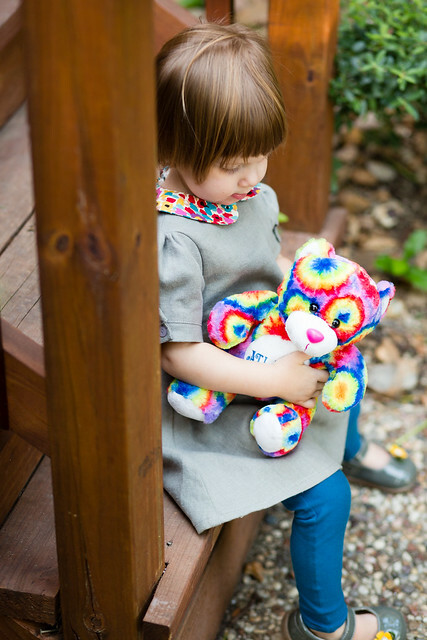 When Iris came toddling out after me, she had her tie-dyed bear under her arm. Which just so happened to match her collar. I'd call that a happy coincidence. Serendipitous, even! 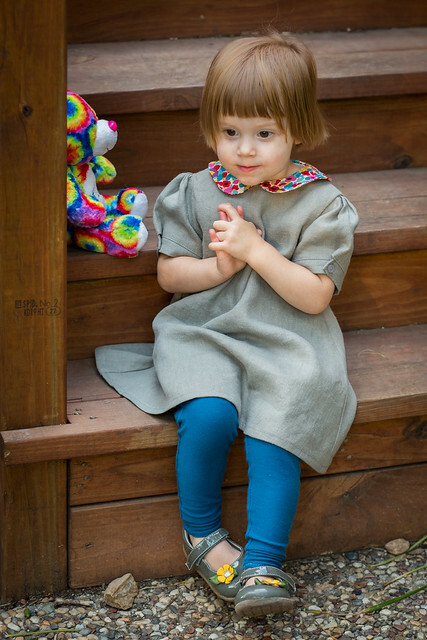 Would it be possible for me to make a dress these days without making a coordinating pair of Sunki leggings? That's a rhetorical question... obviously. :) Now that I know how easy they are, they're a must! I used this peacock fabric. The weight of this knit is perfect for leggings (10 oz). And that's my (modified) Puppet Show dress with Sunki leggings! Absolutely gorgeous! 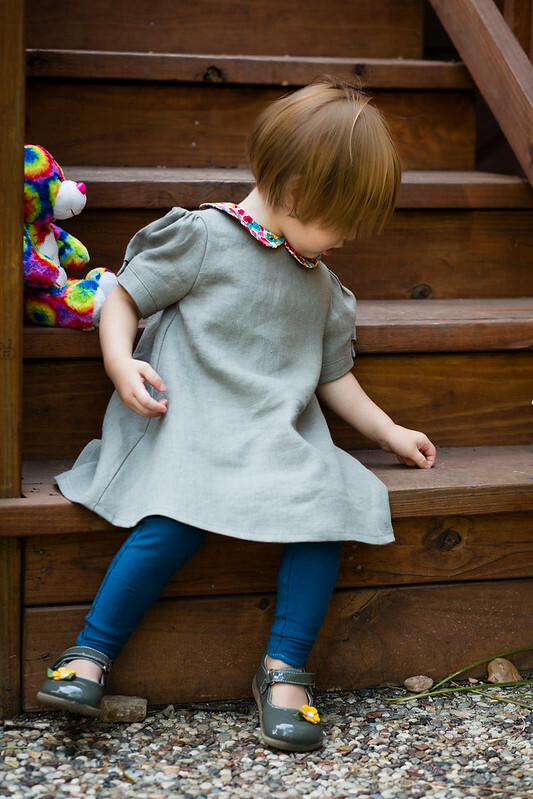 I adore linen and the simple lines of this dress are great. 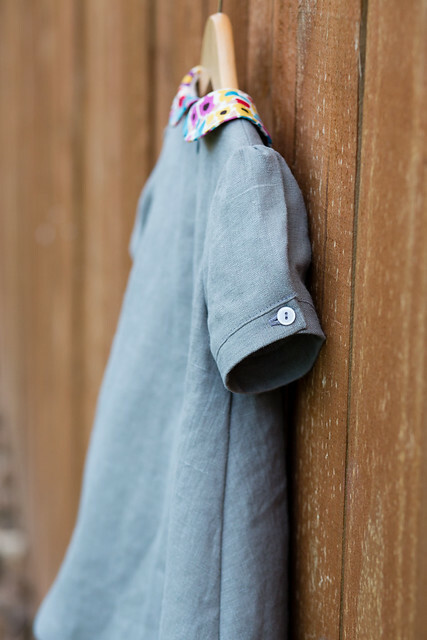 The pop of color on the collar is just perfect. wow, it's just gorgeous. your beautiful details blow me away every time! and those big brown eyes!! Beautiful dress! 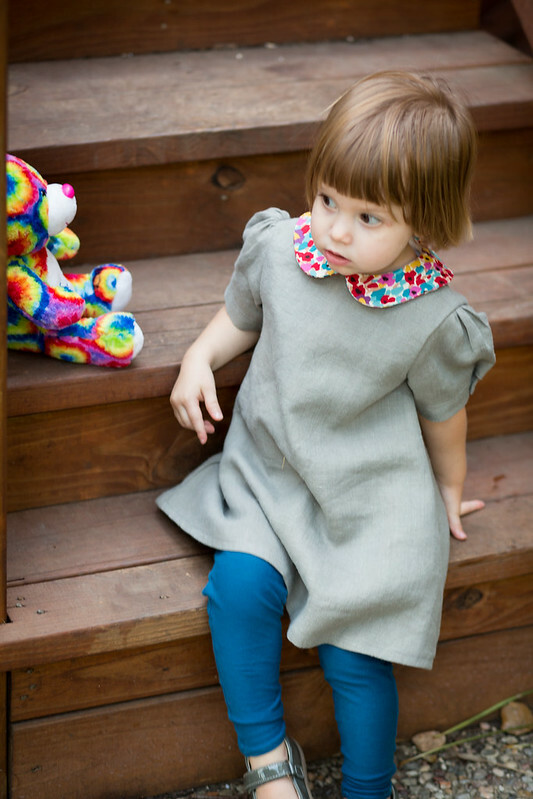 I love the simple lines and the collar, and those blue leggings are a fabulous shade! Gorgeous! What a lovely dress and a beautiful girl (yes, the bear is also too cute)! So simple and yet so striking... Fabulous!!! You so tastefully captured the essence of what drew you to the original dress: the pop of color against the neutral background. 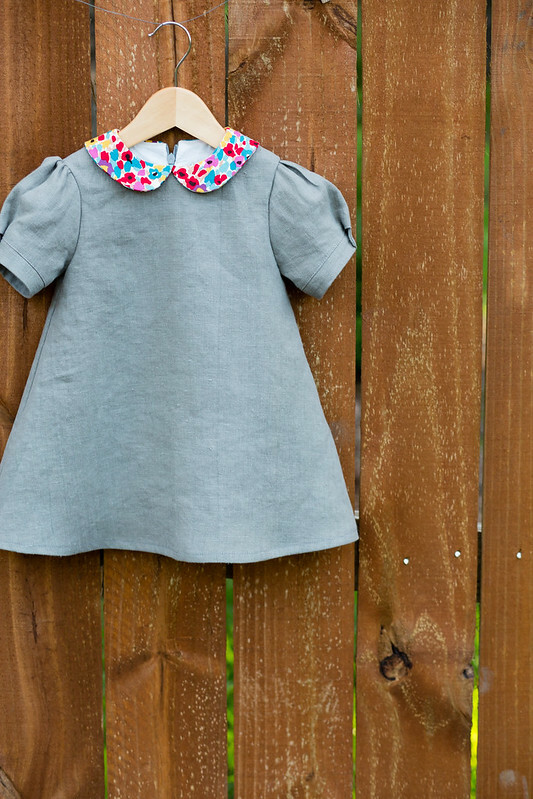 And I much prefer the grey fabric choice:) Love the modifications you made to this pattern. While I own this one, I've only used it for the shorts as the top never spoke that loudly to me. I may have to take another look:) Beautiful job with the leggings too! thanks, lucinda! it's so nice of you to say so. i actually have yet to make the shorts - even though i have seen so many awesome versions on flickr! Taking out the bodice panel has completely transformed the dress. Clever you! 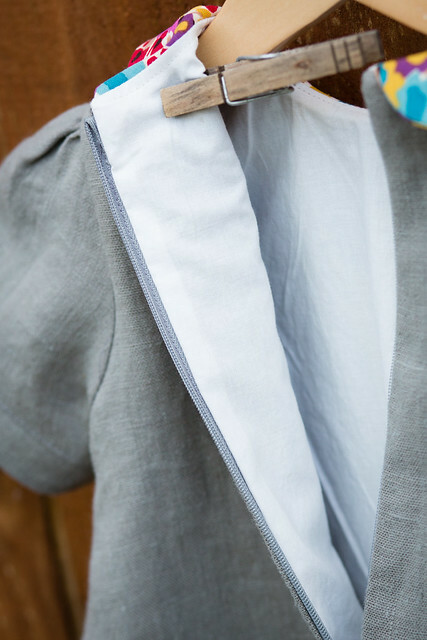 I love how clean and simple it looks like this, and of course you can't go wrong with grey linen in my book! Those big brown eyes got me too! The dress is stunning and your little girl is just beautiful! This is so sweet! I love the fabrics you chose, and the modifications. You're making me want to try the Sunki legging pattern too. I usually layer leggings under dresses and skirts for tree climbing and scooter riding. Wow! Just wow! I love the simplicity of the dress with the pop of the collar! They are perfect together! Absolutely gorgeous, the dress and the child. Oh, this is so beautiful! 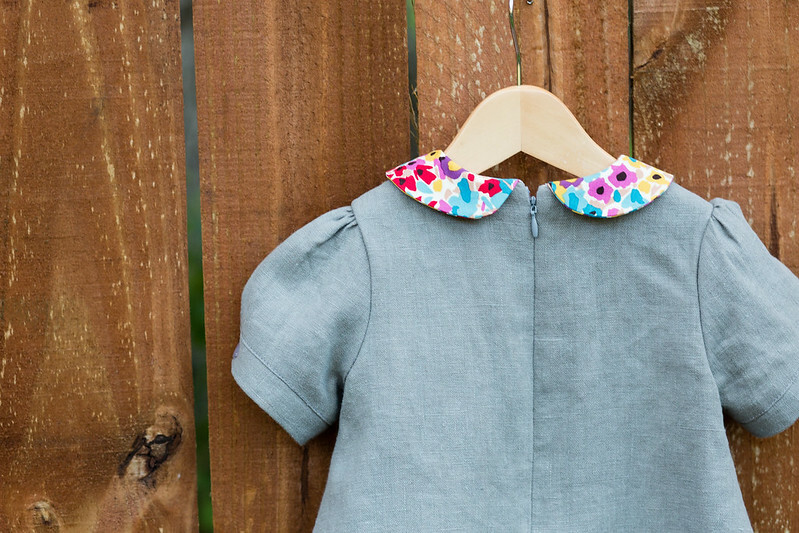 I too love the look of a floral peter pan collar on a plain dress, and linen ... oh, how I love linen. Beautiful. Well that dress couldn't be any more perfect!! I love your eye for detail and the perfect subtle/loud fabric pairings. thanks so much! i really do appreciate that!